"Broly - The Legendary Super Saiyan" & more coming to U.S. Theaters later this year! I randomly stumbled upon these listings while browsing through the "Coming Soon" section of my local theater's website; some sites have more information than others, so I've compiled everything from Paragon, AMC, Marcus, etc. • BARDOCK - THE FATHER OF GOKU: The tale of Bardock, the father of Goku, and his rebellion against his master the mighty Frieza. This is almost certainly being done to help promote the upcoming release of the DRAGON BALL SUPER movie, which is said to explore the origins of the Saiyans and Frieza. What are your thoughts on this? 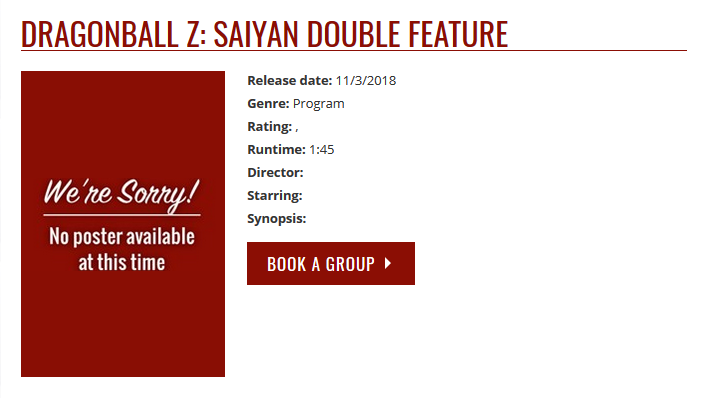 Personally, while I'm alright with Broly, I feel like the "Saiyan Double Feature" line-up is a bit odd; Fusion Reborn hardly has anything to do with Saiyans specifically, and Bardock - The Father of Goku technically isn't even a movie. Wouldn't it make a bit more sense for Tree of Might to be paired up with Bardock since it involves the Saiyans in some way? Not sure what went into making the decision for these two to be shown. Also, I'm wondering if the English premieres will feature the Japanese OST or the American re-scores. I'm a huge fan of Broly's U.S. soundtrack and would be so thrilled to hear Pantera & Tendril coming through those big theater speakers. UPDATE (6/22): TOEI Animation and Fathom Events have been revealed to be the companies responsible for bringing these films to theaters as opposed to FUNimation Films. Sadly, it's been confirmed by TOEI themselves via Twitter that the screenings will be English-dubbed only despite the information initially provided, which suggested otherwise. Last edited by TheBalishChannel on Fri Jun 22, 2018 6:45 pm, edited 1 time in total. Re: "Broly - The Legendary Super Saiyan" & more coming to U.S. Theaters later this year! Big Green Broly! Big Green Broly! Big Green Broly! Cool! Those English and Japanese options have me hopeful. Hopefully when the Super movie comes out it'll be the same way. I'd like to see both languages. I make my own Avatars, both pics and GIFs. If you would like one from any of classic Dragon Ball/Z/GT/The Movies (Dragon Box footage), Dragon Ball Super: Broly, or anything really, just send me a PM. Random set of movies, but I'm putting my money where my mouth is and going to all of the Japanese screenings. Anyone that cares at all about watching the original versions should too. 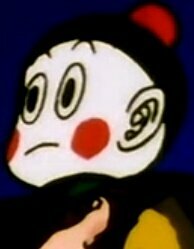 Are they seriously going to show the dub for Bardock: Father of Goku in theatres? Because that dub was not good at all. Other than that, this is really cool! They're showing off Saiyan focused films (Fusion Reborn is kind of an odd choice but I guess it makes sense since Goku, Vegeta, Trunks, Goten and Gohan were the only ones in action) so this is definitely some kind of promo for the upcoming Super movie. It's also really cool that they're giving people the option to watch the films dubbed or subbed. Hopefully they do this for the new movie as well. Forte224 wrote: Cool! Those English and Japanese options have me hopeful. Hopefully when the Super movie comes out it'll be the same way. I'd like to see both languages. If the Japanese has much better vocal direction and no actors phoning it in, I'd probably check it out if there is an option for both in the UK, though given Toei Europe we're probably only gonna get the dub. I’ll be going to those Japanese screenings. Super Saiyan Swagger wrote: Are they seriously going to show the dub for Bardock: Father of Goku in theatres? Because that dub was not good at all. Crossing my fingers and hoping that they take this opportunity to re-dub it. Seems like a really good time to do it; premiere the new dub in theaters and drum up hype for a new DVD/Blu-Ray release. I can't wrap my head around Funimation actually wanting to show the dub they currently have in theaters. They know how that thing reflects on them as a company, right? It's just... embarrassing. Also holding out hope that they show the special uncropped in 4:3, but... let's face it, we've lost that battle. That's what I'm hoping for, too. There is just no way they'll show that dub in theatres. Announcing a re-dub of the special will get some people interested to go see it. The Broly and Fusion Reborn dubs are fine, so I don't see a re-dub happening for them. While I'd very much like these things, paricularly Bardock, to be redubbed, let's be real. There's probably a reason for the Japanese screenings this time around when they didn't do them for Battle of Gods and Resurrection F: those two dubs were up to snuff while these dubs, save for the Broly movie script-wise... aren't. My guess is that they have the dub screenings available because OF COURSE they have to, while the Japanese screenings are to throw a bone to fans lIke us who give a damn about the integrity of the material. It's their way of saying, "Yeah. We know. Here's something for you guys, at least. Please forgive us." The best we can reasonably hope for is that they'll use the Kikuchi score for the dub screenings, which is likely since they wouldn't have to pay royalties to Faulconer and whoever else. For the record, I would LOVE to be wrong, and would literally jump for joy if we got redubs of these things. ESPECIALLY Bardock. I'm just saying that we need to have realistic expectations here. I'm sorry, but if Broly films having theatrical release in US, would that be the case with other countries as well? OmegaRockman wrote: There's probably a reason for the Japanese screenings this time around when they didn't do them for Battle of Gods and Resurrection F.
Lately, FUNimation has been giving movie-goers the option of either watching their screenings in their English-dubbed or original language formats; they've done so with Your Name. last year, Big Fish & Begonia earlier this year, and with their theatrical Attack on Titan Season 3 World Premiere Event this upcoming month (July 10th & 11th). They're following suit after GKIDS' success in providing the choice with their "Studio Ghibli Fest" line-up, as well as their other limited theatrical anime events (Mary & The Witch's Flower, Lu Over the Wall, Fireworks, etc.). Vijay wrote: I'm sorry, but if Broly films having theatrical release in US, would that be the case with other countries as well? It's possible, but these events have been coordinated by FUNimation Films, which is strictly an American distribution company. If such a thing were to happen in your country, it would have to be organized by the license-holders for Dragon Ball Z over there. Trust me, I know that this is common practice with other anime films. However, DB has always been the odd one out by exclusively having dubbed screenings, so I find it strange that suddenly a set of DB theatrical releases has Japanese screenings. Of course I'm happy about that, being a fan of the original version. At the same time, though, it makes me question any possibility of them redubbing the material for these screenings, as much as I'd love it to happen. Wonder which cut of Bardock the Father of Goku they will be using. Can't imagine the movie going public being happy woth seeing Bany Goku...um...."exposed" on the big screen. 99% chance these will be the pre-existing Funimation dubs with the remasters they made for the double feature blu-rays. I really wouldn't expect anything different. They're saying "remastered," so I'm assuming that this will be Funimation's Bluray footage. I sincerely hope that this is a typo. I was banking hard on Japanese screenings. I mean, I don't mind watching Broly in English (so long as it's Kikuchi), but I can't deal with the dubs for Bardock and Fusion Reborn. Best case scenario, these are, in fact, redubs, and I'm completely wrong about them just throwing the current dubs into theaters. Please, dear GOD, let me be wrong. OmegaRockman wrote: I sincerely hope that this is a typo. I was banking hard on Japanese screenings. I mean, I don't mind watching Broly in English (so long as it's Kikuchi), but I can't deal with the dubs for Bardock and Fusion Reborn. Best case scenario, these are, in fact, redubs, and I'm completely wrong about them just throwing the current dubs into theaters. Please, dear GOD, let me be wrong. I pretty much feel the same. The only reason I was excited for this was because of the prospect of seeing them subtitled in theaters. Not only is this disappointing, it doesn't bode well for the upcoming Super movie. Footlong Shoe wrote: I pretty much feel the same. The only reason I was excited for this was because of the prospect of seeing them subtitled in theaters. Not only is this disappointing, it doesn't bode well for the upcoming Super movie. Looks like it's dub-only. A damn shame. I'm not as worried about the Super movie since I expect the dub to be around Kai/Battle of Gods/Resurrection F quality, but it would've been really nice to see it in Japanese first.